A popular choice among students these days is pursuing a double major or dual degrees. It’s a trend that’s on the rise as more and more students look to combine two interests for one invaluable outcome. If you’re a part of this trend, congrats! Fulfilling all of the graduation requirements for either a dual degree program or a double major is no easy feat. It’s an incredible feeling of achievement. While those pursuing a double major will usually earn a single bachelor’s degree with concentrations in two fields, a dual degree is when you earn two separate degrees. One of the many benefits of earning two degrees is that it can easily put your resume at the top of a potential employer’s “yes” pile. And knowing that your family, friends, and colleagues are doubly impressed with your academic efforts is a nice added bonus. You might even say that you earned double bragging rights—twice as nice! Now that you’ve earned them, you might be wondering what to do with those expensive pieces of paper. Do you just stick them in your drawer? Thumbtack them to your wall? What if you graduated years ago and at this point you’ve lost your college diploma? Think of your college degrees as your own personal marketing tools—ones that should proudly be put on display. Your academic achievements inspire confidence in potential clients and remind your employer and coworkers of your expertise in your industry. They should be proudly and prominently displayed! 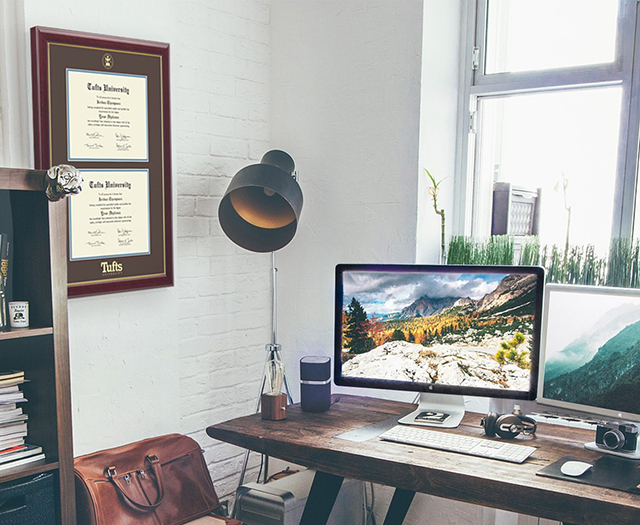 If you haven’t already, it’s time to think about the #1 option for showcasing your diplomas: custom framing. 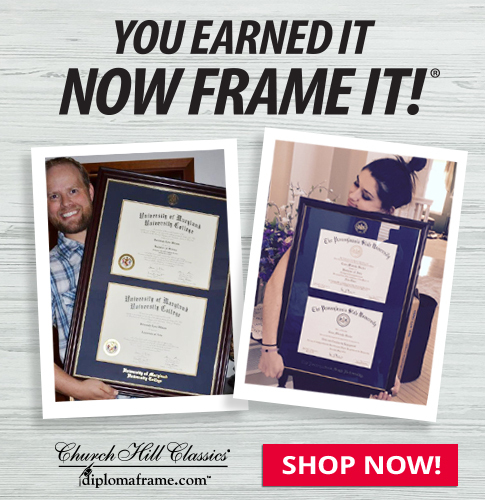 Handcrafted, custom graduation frames will always be a worthwhile investment as they elevate the look of your hard-earned degrees and lend an air of sophistication. Now imagine the impact of two degrees on display in one frame—even more impressive! A diploma is one of the most valuable and important documents you’ll ever own. Professional framing is the best way to safeguard your degrees from mold, insects, and incidental damage, and only archival-quality frames will provide superior protection against tears, deterioration, and UV light. You’re far more likely to lose a diploma that’s still in its original tube or diploma holder. Framing it in a sturdy, high-quality, double diploma frame means it’s less likely to get lost in a move. It’s not easy earning two degrees. 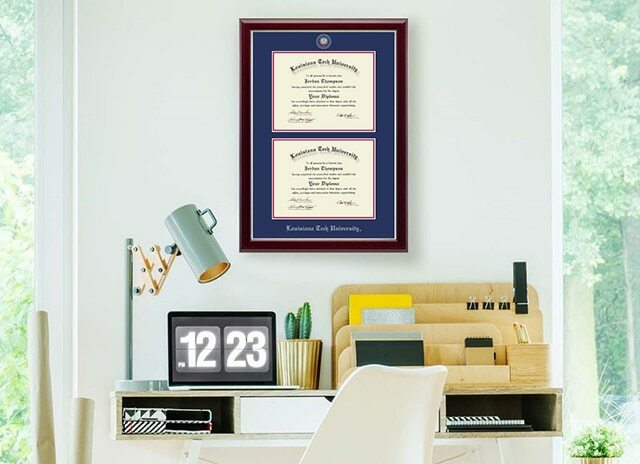 Framed double degrees in your office will give you a constant visual reminder of your success. Showing off your hard work. You worked tirelessly to graduate. After all of the time, money, and energy, why would you toss your diplomas in the attic or stuff them in a messy desk drawer? Hang them up and show them off! Impress clients and instill confidence. Can you remember the last time you visited your accountant, attorney, or physician? Their framed diplomas and certificates are usually on display. Not only are they required by law for licensed or certified professionals in many fields, but they assure people entering the office that they’re working with a trusted professional. With a huge database of schools listed on our website, we make it easy to find your officially licensed double diploma frame. We’ve pre-designed frames for your alma mater, and they’re already sized to fit the exact dimensions of your associate’s, bachelor’s, master’s, or Ph.D. degree—no measuring required! Just search for your school, pick the double frame style, and use our online custom framing tools to select the mat colors and moulding you want. You can search for your specific school diploma frame here. Don’t see a double degree frame for your school? Or, perhaps you have degrees from two different schools? No worries, you can still customize your very own double frame here. Simply choose the document size, select a vertical or horizontal orientation, add embossed insignias or medallions, and pick your mat colors and moulding style. You can add a personalized engraved nameplate or choose to have your state, class year, or field of study embossed on your double document frame. Our double certificate frames can be used to display many types of documents or photographs side by side. Did your company win a special community award? Display that certificate along with a group photo of your staff at the award ceremony. Did you recently open a new business? Frame your business license and a photo of the ribbon-cutting ceremony as a special way to commemorate this big achievement. Or you may want to frame your degree next to that classic “tossing of the cap” graduation photo with your lifelong friends. The possibilities are endless when it comes to double document frames. Not only will this unify your successes in one place, but you’ll also have one larger and brilliant reminder instead of two smaller pieces. 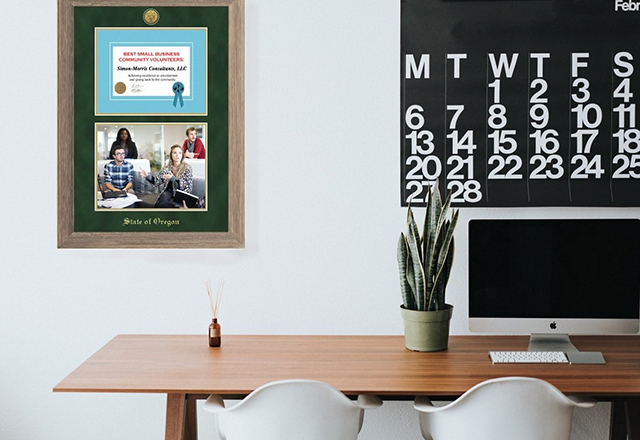 Depending on the layout of your office, a space-saving double degree frame can make displaying your achievements easier when wall space is at a premium. 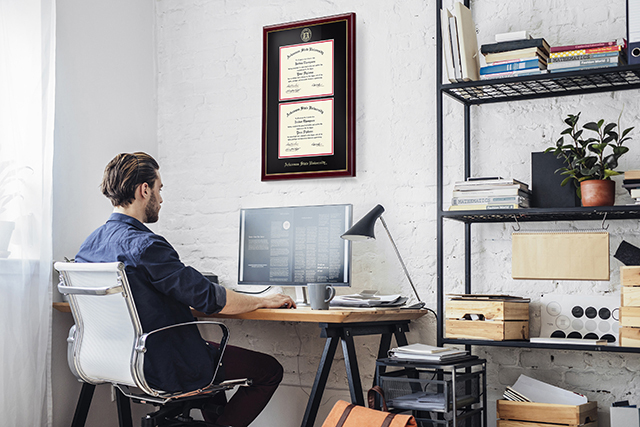 Double document frames aren’t just for showcasing your diplomas, school awards, and college-related certificates. 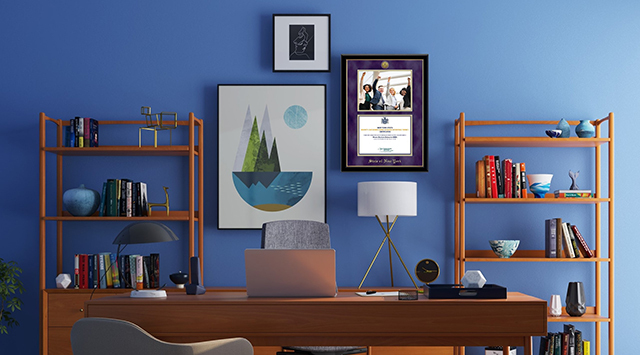 Our made-to-order dual certificate frames make wonderful recognition gifts for clients, employees, students, faculty, and esteemed community members. For the best double frames and custom frame design options, there’s no need to think twice—simply head over to our custom certificate frames page! Whatever you’re framing, be proud of your success and the fact that you’ve taken the time to acquire that knowledge and master new skills. Striving to continually learn and better ourselves is a lifetime pursuit. If you’ve received dual degrees or earned companion certificates, now is the time to stand back, reflect, and be proud.